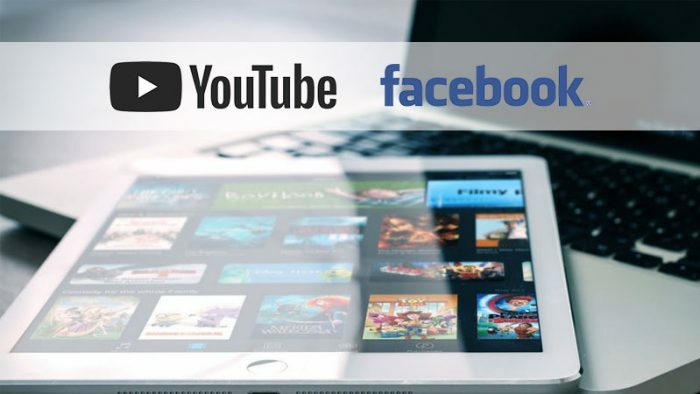 Content statistics in a Vidooly report, suggest that Indian internet users have been observed to be predominantly consuming music content on YouTube, and news content on Facebook. Content statistics suggest that YouTube is one of the biggest and most preferred platform for video content in India with a user base of over 400+ million, meanwhile the Vidooly report also indicates that Facebook leads the list of social media platforms with over 241 million users in India. Across the viewer behaviour surveyed across the top YouTube channels, Music videos were a hot favorite amongst Indians with over 3 billion views followed closely by entertainment videos with 2.4 billion views. Video content for kids ranked third with 1.3 billion views in September alone. 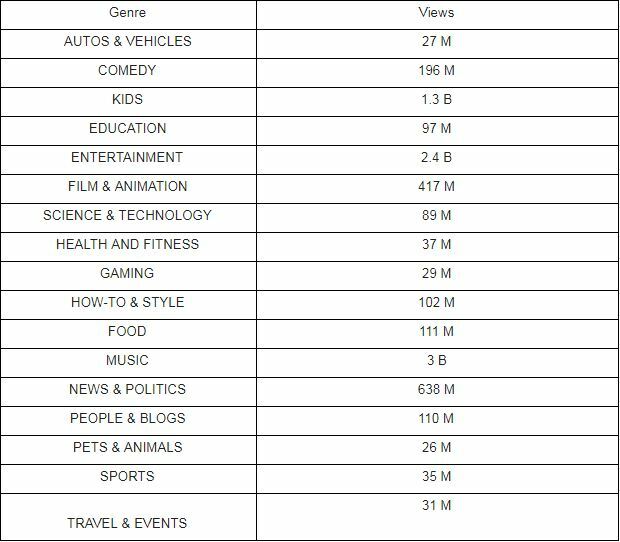 Across the top Facebook pages and viewer behaviour surveyed, News videos was most watched with over 1.58 billion views followed in second spot by entertainment videos with 1.06 billion views. In music alone, Hindi and electronic music were the two most popular genres with viewers in September. In the entertainment genre, regional content in Telugu overtakes Hindi in views but when it comes to news genre regional content in Hindi overtakes Telugu as the most viewed content. The top 10 most viewed YouTube channels in India in September are T Series, SET India, Zee TV, ChuChu TV, Wave Music, SAB TV, Zee Music, CVS Rhymes, Speed Records and Eros Now. Viewers on facebook displayed over trends from earlier months, news videos remained most viewed garnering 1.58 billion views followed by entertainment videos with 1.06 billion views with independent creators ranking a distant third with 416 million views. 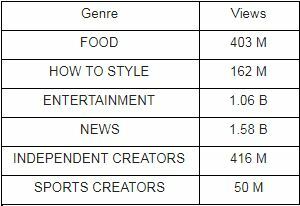 In terms of views regional news again takes the top spot with Hindi news videos garnering over 1.003 billion views in the entire category. The top 10 Facebook pages with most views in September are ABP News, Dainik Bhaskar, Aaj Tak, Vijay Television, ABP Majha, ABP Live, Hebbar’s Kitchen, The Amit Bhadana, The Times of India and Aashqeen1.